It is no secret that Ireland has some of the world’s finest weed. Not only that, it is in plentiful supply, cheap and and it’s a superfood. The weed is, of course, seaweed, and anyone who has had a seaweed bath will not need convincing as to its benefits.In terms of sustainability, seaweed is also a no brainer, and so it is exciting to see that the Inchydoney Island Lodge and Spa in West Cork has created a two-night “Seaweed Experience” package which has you living and breathing the stuff. And not just within the confines of a spa either. Realising that many people are now looking for a low-impact, green, activity-based break, not just a lie in the spa, drink and eat all weekend sort of a break, Inchydoney may inspire others to follow suit and get their guests teaming up with local, green activity providers, nature experts and guides. 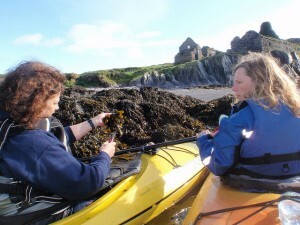 Inchydoney has picked two of Ireland’s best: expert kayaker and local marine life font of knowledge, Jim Kennedy of Atlantic Sea Kayaking, who brings guests out on local waters alongside Sally McKenna, of the Bridgestone Guide fame, who has successfully combined her food knowledge with a passion for paddling to bring people seaweed foraging. Over the duration of a day on the water, I learned kayaking skills with Jim, whose sense of humour and reassurance that kayaking is a gentle sport for all ages, and not for adrenalin junkies, immediately put me at my ease. He led me into hidden caves and coves and from island to island, pointing out seabirds and seals and keeping an eye out for dolphins. Suddenly, as we emerged from an explorative paddle, Sally would appear out of nowhere, full of child-like excitement about a certain kelp or wrack she had found, so we all paddled over to study it, harvest some carefully to allow regrowth, taste a bit, and learn about its growth patterns and healthy properties. Sally’s love of this most underrated food source, from how it grows to how to eat it, was totally infectious. We stopped for lunch on a deserted island, where she prepared dulse and potato soup, served with scones made with laver seaweed and served with dulse and lemon butter. All merited a Bridgestone plaque, I should add, not forgetting a kelp and carrot cake. By the end of the day, I had noted down all of her seaweed recipes, books for further reading, and vowed to bring my kids foraging as soon as possible. You’ve got to watch this weed thing, it’s addictive. white strand, close enough to walk barefoot from our room with a view of the Atlantic. But really it was the day of paddling and exploring, learning and laughing out on west Cork’s waters which makes this trip extra special. 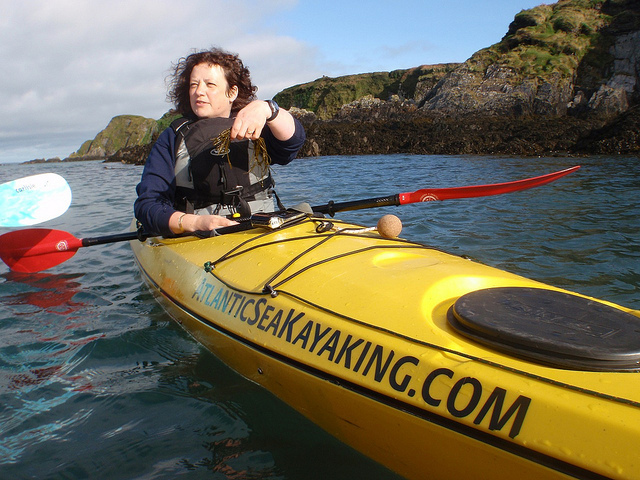 It is not surprising that Atlantic Sea Kayaking was recently chosen as one of Trip Advisor’s Top Ten “Most Exciting Alternatives to the Typical Tourist Holiday”. Fair play to Inchydoney for celebrating and supporting such an ethical activity provider, and bringing them to the attention of those who might not otherwise find the world that awaits them, beyond the spa and into a world of bladderwrack bliss. You can also watch a video of my (sorry it’s a bit windy) experience here. 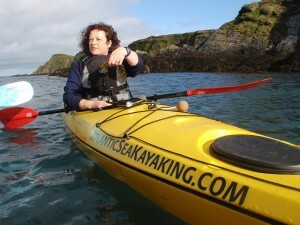 This entry was posted in Articles and tagged activities Ireland, Atlantic Sea Kayaking, green tourism Ireland, inchydoney Hotel, kayaking Ireland, sea kayaking Ireland, seaweed foraging, things to do in West Cork, West Cork. Bookmark the permalink.